Donnerschwee is one of numerous Donnerhall sons who are approved for various German breeds. He has not been used extensively in his early years and it is only since 2001 that he is more frequently used both nationally and internationally. 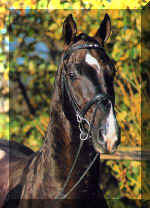 In 2002 there were only 74 registered show horse progeny but he has already produced 2 licensed sons: D-Day who was highly desired at the stallion market and eventually passed his stallion performance test in class I and Don Rubin who ended up in the premium lot at Vechta licensing 2000 and sold for no less than 380,000 DM. 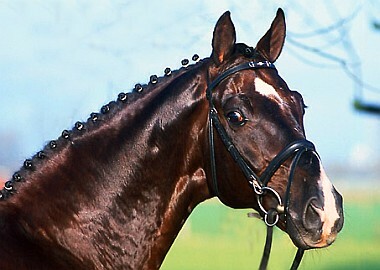 Donnerschwee himself is trained and showing successfully at Grand Prix level. Best breeds to short mares with a lot of TB connection who need improvement in substance and dressage ability. His offspring is with no exception very kind and quiet. 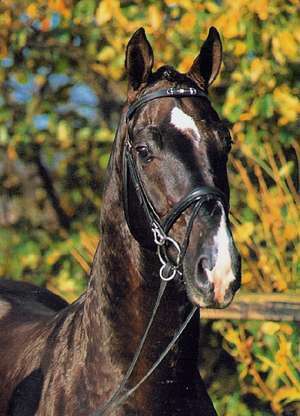 In the Hanoverian breed evaluation which is based on inspection scores of female progeny, mare performance test results and auction horse evaluation (as of 2003) he ranks 10th out of all listed stallions used within the Hanoverian breed and scores a significant 159 index points for improving dressage ability. He is also considered to reliably improve limb conformation (149) and slightly improve riding horse points and type (114). In the nationwide FN evaluation (which includes all German breeds and is based on show-performing offspring, SPT and MPT scores as well as a stallions own performance at shows) he scores 149 for dressage. 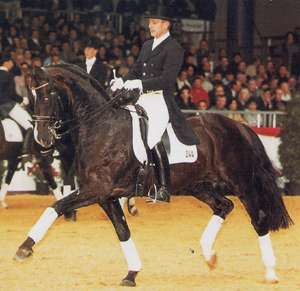 He is the sire of the highest scoring Hanoverian mare at mare performance tests who scored outright 10's on walk, canter and rideability as well as the reserve MPT champion at Münster-Handorf/Westfalen (2001). Winnings and placements in dressage up to GP level.